Is arrogant ranching to blame? After many articles here in TWN this year, and elsewhere, about the growing pneumonia epidemic in the bighorn sheep herd just north of Yellowstone Park continues, now 40% of the bighorn are dead. More bighorn are sick. Details in Yellowstone Gate. Now, there is little to stop the disease from spreading southward into Yellowstone Park. Little can be done except to remove (likely to kill) those infected bighorn closest to the Park. People are asking how did this infection get started, and fingers are most commonly pointed to domestic sheep pastured adjacent to the bighorn. That domestic sheep infect bighorn has been proven in recent years, and bighorn infection after bighorn infection in the West is tied to the woolly white critters. North of the Park, blame is often given to the sheep owned and pastured by Bill Hoppe or perhaps two other nearby sheep operations. Montana Fish, Wildlife, and Parks (MTFWP) confirms that bighorn have contact with Hoppe’s sheep. This dire contact will continue due to proximity. Todd Wilkinson discusses the bighorn and Hoppe’s sheep in the latest Jackson Hole News and Guide. 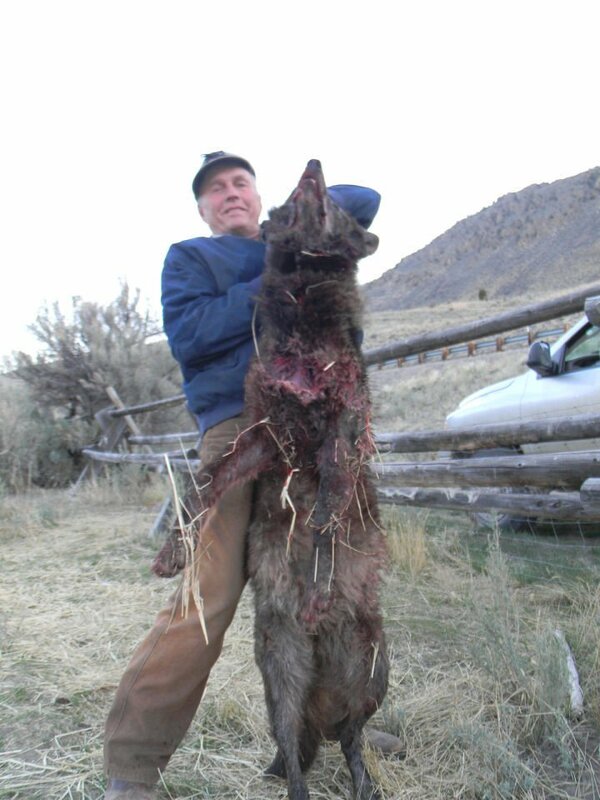 Despite having had quite a career as an outfitter utilizing Yellowstone’s outmigrating wildlife, according to Wilkinson for years Hoppe has been a vocal opponent of Yellowstone Park policies, including the wolf restoration. Hoppe also placed his sheep right in front of wolves near the Park boundary. See TWN 4/26/13. At the present, there is apparently no legal way to prevent Hoppe or others from pasturing their sheep next to the bighorn. In this case the bighorn were there first. Hoppe’s sheep are very recent. Montana could pass laws to prevent this if it had the political will. States just don’t have the will. Some, like Wyoming, side with infected sheep, holding bighorn hostage. See TWN, 3/5/15. Lack of regard for the public is not limited to the point of threatening America’s first, perhaps greatest, national park. Ranching’s triumph over the public is general, from the flaunting of the law by Cliven Bundy’s imaginary, sovereign Nevada to the massive subsidies of the .01% multi-millionaire and billionaire ranches. The public finds their right to access the land denied as these properties disappear from public view behind no trespassing signs. Entire states are dragged into the no access game, such as Wyoming with its recent passage of a law to make it a felony for anyone who crosses a ranch and who collects undefined “data,” even on public lands on the other side. The largest ranch in Montana, the Matador Ranch, is owned by the Koch Brothers who are behind much of the public land privatization impetus in Congress and the state legislatures. Ranching will not be satisfied until the public’s right to travel is limited to a few parks and main roads outside the cities. Another billionaire (Stanley Kroenke, real estate mogul) owns the largest ranch in the Rockies, Wyoming’s Q Creek Land and Livestock. While some include Ted Turner among the ranching oligarchs, his good work with wildlife on his many ranches earns him credits with the public interest. Ranching has never been, and never has been viewed as a forward looking activity. It has never been associated with democracy. If anything, in country after country, ranching is a part of the oligarchy. Ranching’s recent aggressiveness in the United States can be seen as more aspect of the destruction of the middle class and death of democracy. You mean the Bill Hoppe that baited in a killed a wolf a few years back? The guy’s the gift that just keeps on giving. Mr. Hoppe doesn’t sound much like the friend of any wildlife. I say we find all revenue streams for Hoppe’s bunch and work on cutting it off. Obviously a beginning would be his little lodging enterprise. I’ve heard it is a filthy mess. These billionaires are not ranchers. They buy up these properties as tax shelters to launder their money. These are the same creeps that will buy our public lands if the states get title to them. They might not have begun as ranchers, but most of them share the same belief that they obey only the laws they want. Views of the public merit no consideration. It appears Bill Hoppe is one of the ~5% of the population who just don’t “get it”. I’m sure MFWP has tried to work with him about his “blah blah blah” sheep to no avail. Somebody needs to give him an “offer he can’t refuse” if you know what I mean. Bighorns are such awesome animals as they climb straight up cliffs and are a big attraction for Yellowstone NP. It seems like we are on a path to completely lose bighorn sheep. Others would know better than I but from what I’ve read here at TWN it doesn’t appear they have much of a chance. Our own federal agencies are not protecting them and appear to even encourage actions that put them in danger. This is a great loss. We have elected killers into political offices. They don’t care about Wolves, Coyotes, Buffalo’s ,Wild Horse’s and Burros. Utah wants all wild horse’s and burros even if it lethal means. Madness and psychopathic behavior. This is so wrong. Livestock ranchers don’t care as well. Livestock ranchers and politicians are destroying our wild animals and destroying Our Public land’s. If you can’t move against them legally for -where- the sheep are, can anything be done to require them to inoculate ALL of their sheep against pneumonia? To force them to move the herds more frequently to prevent damage to the range? You can phrase it as being required to safeguard the domestic sheep and cattle populations and use their own arguments against them. I’d be interested to know the demographics of citizens, especially those west of the Mississippi river, (only because of the western politics with public land and public grazing issues) that have a keen interest in public land protection and wildlife. What percentage of citizens approve of current federal policies regarding wildlife management. Where would they rank their interest in the issue? How many citizens know about public land grazing and the adverse affect on habitat, water, and wildlife? What is their level of knowledge? And of course, much more, but we seem to have plenty of citizens that are concerned. What are their key interests and issues of concern? If we have a large number of people that are concerned about wildlife, how wildlife is managed, public land management and pubic grazing and open range grazing. I may not have a lot of hope or faith left in government, policy or people, but I still have enough left to believe a large number of people can go against a small group of powerful and well financed people. I wonder if enough people are interested or are we mostly just blowing off frustration on social media and blogs? Unfortunately, I think that the majority of politicians and voters in the Western public land states are clearly on the side of the ranching industry no matter what the costs. Any influence to proper land and wildlife management must therefore mostly come from the federal politicians and voters in the more enlightened states East of the Mississippi River and the three Pacific states. Yvette, I am a young voter in California. My main concern is the preservation and protection of wilderness areas and of all natural wildlife. I try to educate myself on these issues so that I can fight back when the time comes. My interest in this is at least at 95%. Especially since I live in drought-stricken California and I see exactly where the majority of our much needed water is going. It leaves the wildlife of our state with no chance or hope for survival. Remember that there is a new generation of Western American voters who are young, who see what the impact of public land grazing has had on our wilderness areas, and who are sick and tired of seeing our land and it’s natural inhabitants raped. I haven’t lost faith yet.